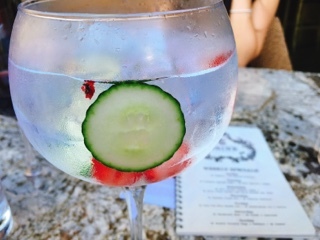 Reds Midtown Tavern is a great place for gin and tonics: with 29 types of the spirit and three different tonic waters, you can customize whole heartily. If you’re like me and the selection stumps you, they also have a selection of G&T cocktails (all $9 on Fridays). The foxy lady (normally $13.25) is ultra-refreshing made with my favourite Hendrick’s gin and Fevertree Mediterranean tonic. For a drink that looks rather plain, every sip brings an array of flavours given its also incorporates rose water, mint bitters, and an infusion of strawberry and cucumber. Their food on the other hand, is average at best. Even for a person who loves salty foods, I found the truffle fries ($8.75) over seasoned. 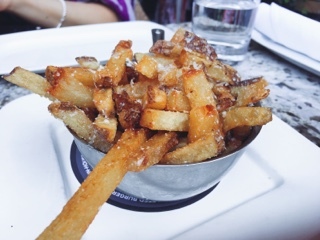 The freshly made fries were good but with so much salt and parmesan the truffle essence became lost. And it’s likely my own fault for the passable main – why would I visit a restaurant in downtown Toronto specializing in fancy cocktails and order low country fried chicken ($18.95)? Never order to what you’re craving and rather to the restaurant (despite their fault for offering something on the menu). I would have been better off with a steak sandwich. The restaurant’s first mistake was using boneless chicken – sure it’s much easier to eat but the juiciness and wonderful Southern specialty is non-existent. Truthfully, the chicken was tender, but aside from the salty breading the dish lacked flavour. If it’s renamed “boneless fried chicken” or “fried chicken tenders”, at least there would have been a warning and I’d stay away. Unlike the truffle fries, the ones that accompanied the chicken weren’t as salty so you could actually enjoy the potato flavour. 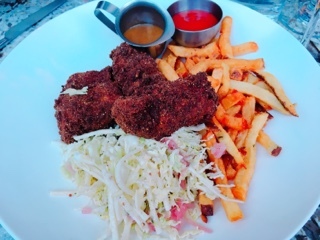 The coleslaw, dressed in a sweet and spicy vinaigrette, is an interesting choice and goes rather well with the fried chicken helping to cut the grease. But, with a light sweet side, I would have preferred the dipping sauce to be more savoury instead of the honey Dijon, which reminded me of the slaw itself. Despite the run-of-the-mill food, Reds’ service was great and being a large restaurant, you don’t feel bad sitting at the table longer and starting with a round of drinks before moving into dinner. And if you’re not particularly hungry, trying their gin and tonics is a good enough excuse for a visit.